One of the best parts of Halloween is carving the pumpkin. This Halloween, why not gather a few friends together and throw a pumpkin carving party? Keep the party laid-back by making it a homemade affair. There’s no need to spend money on store-bought invitations when your budding artist can create adorable ones personalized with her own stylish touch at home. This smiling paper pumpkin is sure to bring ghoulish cheer to all who receive him. Fold one sheet of orange paper in half like a greeting card. 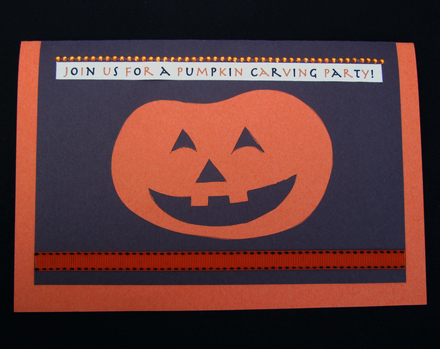 Fold the black sheet of paper over it and trim it on all sides so that it is slightly smaller than the orange sheet. This will create an orange border for the card. Glue the black paper onto the orange. Ask your child to draw a pumpkin on the second sheet of orange paper. Parents, use an X-acto knife to cut out the pumpkin’s face. 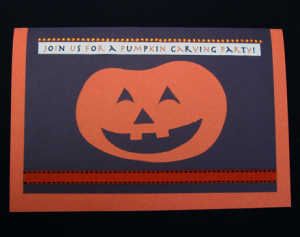 Have your child glue the pumpkin onto the card. Help your child handwrite the party title on the front of the card, or print it out from the computer. Cut the white paper in half widthwise, then trim it down a little more so it fits nicely on the inside of the card. Help your child write the party details by hand on the white paper. Alternatively, type the party details on the computer, print them out, and cut the paper to fit inside the card. Attach the party details to the inside of the card with a pair of brads. If you don’t have brads, simply tack it onto the card with glue. Have your child embellish the card using ribbon, glitter glue, stickers, or beads. To save time, print each guest’s mailing address onto labels and ask your child to stick them onto the envelopes. Once all the invites are finished, set off for the post office and drop these beauties in the mail!